Qualification for the 2018 World Cup started for AFC Member Countries back in March 2015 with a small knockout round featuring the lowest ranked Asian Nations. After this the big boys such as South Korea and China joined in a 2nd Round Group stage. Both progressed to this 3rd round stage. The group A table in still tight at either end, but there is a gap growing in the middle. Iran lead the way closely followed by South Korea and Uzbekistan. Syria, Qatar and finally China PR sit at the bottom and can’t afford to lose anymore games. South Korea have a strong recent history regarding World Cup Qualification, having made the finals 8 times on the bounce now. With their best performance coming in 2002 when they reached the Semi-Finals on home soil. Now under the leadership of German coach Uli Stielike they looked strong so far during qualification, easing past the 2nd round group stage. 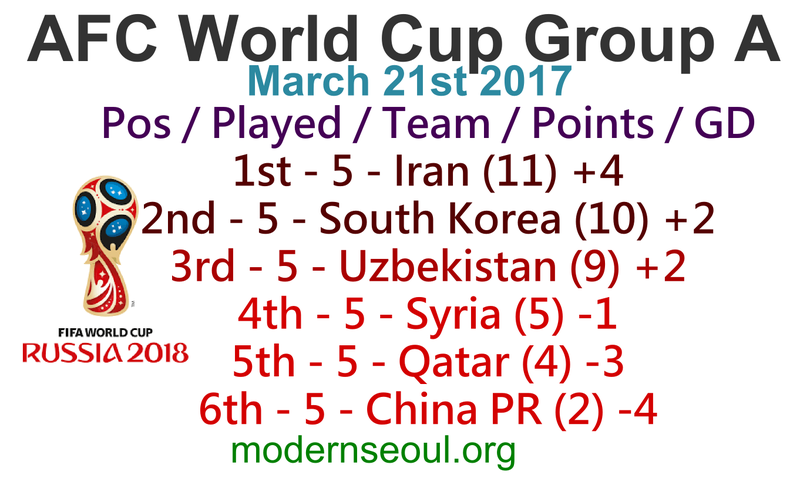 During this round stage they’ve been solid with defeat to Iran and a draw vs. Syria the only issues, they won the other 3 games including the home games vs. China. Key Player: Swansea City midfielder Ki Sung-yueng controls the Korean side in the middle of the park, so he will be key moving forward and at the back. China despite being the worlds most populous country have only qualified for World Cup once in their history back in 2002, and they don’t fare well losing all of their games. Qualification hasn’t been plain sailing so far as they only reached this stage as a best runner-up with draws against Hong Kong and defeat to Qatar. They did however hammer Bhutan 12-0. During the final round they’ve struggled again drawing twice and losing 3 times, no wins so far. Recently hired coach Marcello Lippi might add something new however. Key Player: Former Benfica now Beijing Guoan forward Yu Dabao is dangerous moving forward as can both score and create. One for the future is the only overseas based player Zhang Yunging who plays for Vitesse in the Dutch Eredivisie, at only 20 years old he is considered to be one of China’s stars of the future. The single win for China came back in 2010 during the East Asian Cup. South Korea won the last game back in September 3-2 which was also the first time they played each other in a World Cup Qualifier. 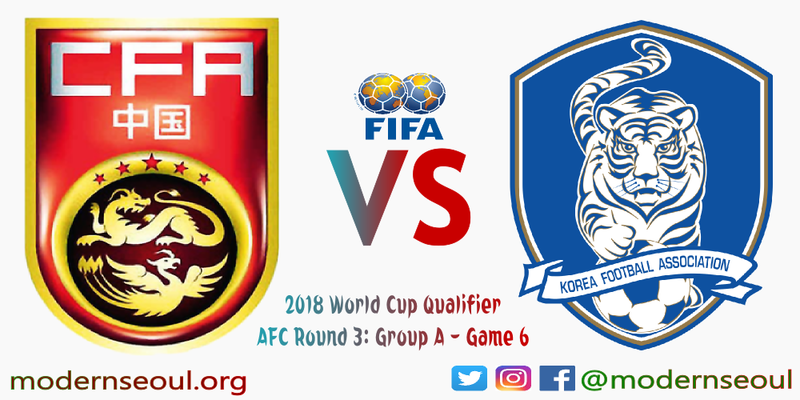 On paper and historically South Korea are the strong side, however China at home are supported passionately and therefore we see this ending in a draw. A result maybe neither side will be happy with however. South Korea looked disjointed as they fell to a disappointing defeat to an improved China PR. Yu Dabao scored the only goal of the game capitalizing on some weak Korean Defending. Korea now have to win their final 4 games to confirm a spot in Russia, if they lose again they might have to settle for a playoff spot or worse.